Wed., July 13, 2016, 9:56 p.m. 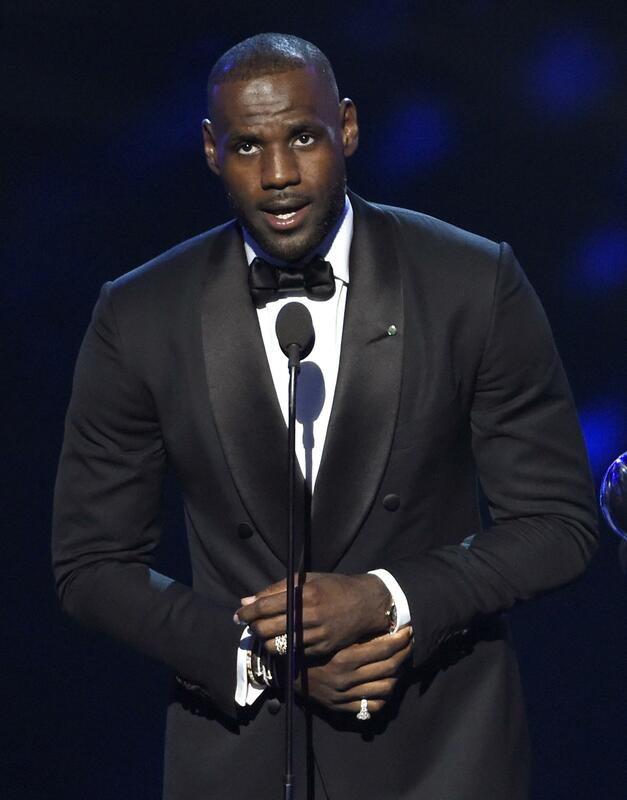 Awards: LeBron James won five trophies, including best male athlete and best NBA player, at the ESPY Awards on Wednesday night at the Microsoft Theater in downtown Los Angeles when frivolity gave way to a James-led call to end gun violence and racial profiling. In her speech, Stewart called for equality for women athletes. The Pat Tillman Award for Service was presented to Paralympic swimmer Sgt. Elizabeth Marks for her strength through adversity and continued service to her country. Singer Justin Timberlake gave the Icon Award to Kobe Bryant, Peyton Manning and Abby Wambach, all of whom retired from their respective sports this year. Men’s basketball: Los Angeles Clippers owner Steve Ballmer said Wednesday he doesn’t see Seattle landing an NBA franchise “within the next year or two years” to facilitate public funding for an arena. Speaking at the Geek Wire Sports Tech Summit at Safeco Field, Ballmer, the former CEO of Microsoft, said there have been no talks about NBA expansion at the owner level and Seattle’s quickest hope for an arena might involve bringing hockey here first. Ballmer had partnered with entrepreneur Chris Hansen on his Sodo District arena project, but left that group two years ago to buy the Clippers for $2 billion. Duncan tried to avoid much of the praise, watching former teammate Bruce Bowen’s tribute on ESPN and coach Gregg Popovich’s emotional news conference on Tuesday. Matchups set for 2K Classic: Pittsburgh will face SMU and new coach Tim Jankovich, and Michigan meets Marquette in the semifinals of the 22nd annual 2K Classic benefiting Wounded Warrior Project, which returns to Madison Square Garden this year. The semifinals are Nov. 17 with the championship game the next night. The tournament moves back to Madison Square Garden after being held at Barclays Center. WNBA: Brittney Griner had 22 points, eight rebounds and five blocks, Sonja Petrovic made a go-ahead basket with 29.9 seconds left and the Phoenix Mercury beat the Washington Mystics 78-74 on Wednesday. After Petrovic’s floater in the lane, Emma Meesseman missed a left-handed hook shot and Griner made two free throws. Washington’s Tayler Hill had an open 3-pointer rattle out with 7 seconds left. Diana Taurasi added 18 points on 4-of-18 shooting for Phoenix (9-13), ninth in the AP power poll. Meesseman scored 22 points and Hill added 15 points for eighth-ranked Washington (9-12). Ogwumike lifts Sparks: Nneka Ogwumike had 20 points and 11 rebounds, Candace Parker added 11 points, seven rebounds and nine assists, and the Los Angeles Sparks beat the Chicago Sky in Rosemont, Illinois. Ogwumike was 10 of 11 from the field for her fifth consecutive game with at least 20 points. Kristi Toliver had 13 points, Jantel Lavender added 12 points and Essence Carson scored 10 for Los Angeles (19-1), the top-ranked team in the AP power poll. The Sparks had 28 assists on 33 field goals. Elena Delle Donne scored 15 points and Quigley added 13 for sixth-ranked Chicago (8-12). Liberty’s BLM shirts lose hashtags: New York Liberty players are still wearing warmups to support the Black Lives Matter movement – but their shirts won’t be imprinted with hashtags created after recent police shootings. The Liberty first wore black shirts Sunday with the words “(hash)BlackLivesMatter” and “(hash)Dallas5” on the front and a hashtag with a blank space on the back. But on Wednesday, players wore plain black Adidas shirts before a game against the Atlanta Dream, and said the decision was due to a compromise made by the players to wear the branded warmup shirts. Miscellany: Lehigh Valley’s Edward Mujica and nine other relievers threw seven scoreless innings in the International League’s 4-2 victory over the Pacific Coast League on in the Triple-A All-Star Game in Charlotte, North Carolina. Columbus’ Erik Gonzalez, Lehigh Valley’s Andrew Knapp and Pawtucket’s Chris Marrero homered for the International League. Baylor hires Rhoades: Baylor hired Mack Rhoades as its new athletic director, bringing in an experienced administrator it believes will help the reeling program rebound from allegations that it didn’t properly handle sexual assault claims against its football players. Small loses arbitration case: Veteran cyclist Carmen Small lost her arbitration case for a spot on the four-member U.S. team headed for Rio, and will be forced to watch from the sidelines as the powerhouse women’s squad rides for gold. Megan Guarnier was the only rider who earned a guaranteed spot on the squad by virtue of her bronze medal at the world championships. That left three discretionary picks that went to two-time and reigning Olympic time trial gold medalist Kristin Armstrong, veteran Evelyn Stevens and climbing specialist Mara Abbott. Amber Neben also lost her arbitration case. The 36-year-old Small had argued that her handy victories over Armstrong and Stevens at the time trial national championships this year should have helped her earn a spot. Published: July 13, 2016, 9:56 p.m.